18 cm tall (7 inches). 18 x 11 x 19 cm. 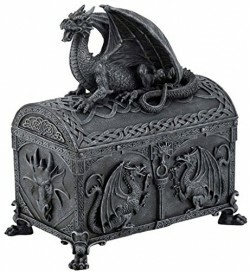 Celtic themed stone effect trinket box with a guarding dragon poised on the lid. 4 clawed feet feature. Very nice quality and excellent detail. Feels solid and weighty. Hinged lid. Opens like a chest. Felted on the inside.